Crayonista, n. One who performs strategic transport planning with a box of coloured crayons, using them to draw lines on a map, without thinking through the implications. Make no little plans. They have no magic to stir men's blood and probably themselves will not be realized. Make big plans; aim high in hope and work, remembering that a noble, logical diagram once recorded will never die, but long after we are gone will be a living thing, asserting itself with ever-growing insistency…. Think big. But lately I’ve begun to think about what Burnham said differently. I am reminded of another quotation. Pierce Butler, a delegate to the convention that wrote the Constitution of the United States, said that the convention “must follow the example of Solon, who gave the Athenians not the best government he could devise; but the best they would receive.” Maybe the right way to read “make no little plans” is to read it not as a heroic call to grandeur, but as a resigned acknowledgement that people are irrational and that quality of a plan is less important than its appeal. Naturally, I think of the East Bay Bus Rapid Transit project, which was originally intended to operate from Berkeley through Oakland and San Leandro via Telegraph Ave., International Blvd., and East 14th St. The analysis was that BRT was much more cost-effective than light rail would have been in the corridor studied, and I have no doubt that this is true. But community opposition truncated the route, and now it will not serve North Oakland, Berkeley, or most of San Leandro. Was this a case of giving people the best plan that could be devised, not the best that could be accepted? Maybe light rail would have been a better option after all, despite the extra cost, not because it’s inherently better but only because community members who couldn’t imagine themselves riding buses could indeed imagine themselves using light rail. That’s how airport transit works. People who don’t use transit very much, or at all, always wonder why the train doesn’t go to the airport -- because that’s the one place they can imagine using it. In fact, usually the number of airport travelers per day is small compared to the number of people normally needed to justify a large transit project. But that doesn’t matter, and so we got BART to SFO in the 2000s and BART to OAK in the 2010s: both poor projects from a cost-effectiveness standpoint, but good projects in that people who don’t normally ride BART think they might make an exception to use them. But are those fun questions? Do the results lend themselves to pretty schematic maps with lines in bright primary colors? They do not. So here is a post to say, if you can't beat 'em, join 'em. Aside from being a way to show off my mad Adobe Illustrator skillz, this map represents proposals which are almost certainly impossible, but I thought were interesting to think about. First, some background to all this. I lived near the N-Judah from 1980 to 1984, just after Muni started Muni Metro. Sadly, over the years it has become more and more clear that it has not been a success. It's not anybody's fault at Muni -- it's just that streetcars in mixed traffic are inherently slow and unreliable. They're even more so than buses. I've got caught in my share of streetcars stuck behind automobiles that were just a bit over the line; of course, streetcars can't move out of the way the way a bus can. The unreliability caused by street traffic carries through to the tunnels, too, making that expensive capital infrastructure much less useful than it should be. To me the ultimate proof of Muni Metro's lack of success this lies in the existence of the "NX Judah Express" bus. If it's faster to take a bus, why do we have such expensive infrastructure? Of course, that infrastructure itself isn't even being used to its full extent. Many of the Muni Metro stations are much longer than any Muni Metro train; they were designed to be as long as BART's 10-car trains. To deal with this, Muni is experimenting with having two trains stop in the station at the same time, one in the front of the station and one in the back. I'm sure eventually they will get this to work, but it still seems like it will be confusing and difficult for passengers, since they won't know in which part of the station their train will stop. Someone writing at Next Muni Metro have proposed a more radical alternative. They suggest operating the existing Muni Metro subway on its own, without operating on the street. The other streetcar lines would operate only on the surface. People would require transfers to get downtown, but the system would be much more reliable than the current mixed subway/streetcar system. It's a good idea to start with, but what if redoing Muni Metro were combined with some other ideas? There has been much discussion lately about the need for a second Transbay Tube, to provide for redundancy with the existing tube and increase capacity. I think this is a reasonable long-term project (although there are many interim steps that could be taken in the meantime). However, it's not clear where the second tube would be placed. A number of recent proposals have the second tube traveling from Mission Bay under Alameda to meet BART somewhere in downtown Oakland. Adding redundancy is a good idea, but I question the value of running a new tube south of the existing one. It seems to me that people taking BART from south of downtown Oakland already bypass the busy 12th and 19th stations, so a new tube wouldn't help them get to San Francisco faster. A new tube could serve Alameda, but it seems unlikely that Alameda will end up having enough urban development to justify the costs of building a subway there. Actually, constraints in capacity in the current BART system have a lot less to do with the Transbay Tube than they do with the stations on either side of it. Dwell time, the time trains take waiting at the platform for people to get in and out of the cars, is the real constraint. This is why during very large events BART has some trains stop at Embarcadero and other trains stop at Montgomery. It's also why BART's new cars will have three doors instead of two. One idea proposed by BART is to add extra platforms at Montgomery and Embarcadero, the two busiest stations. These platforms, on the outside of the stations (called "saddlebag" platforms), would allow people to exit on one side of the car while people enter on the other side. If people could enter and exit at the same time, the trains wouldn't have to wait so long in the stations. Of course, this doesn't add as much capacity as an entirely separate subway. SFCTA has recently proposed an extension of the underground portion of the Muni Metro. They propose taking the M back underground just southwest of Saint Francis Circle, and running it in a new subway along 19th Ave. until it reaches Parkmerced. It would then travel on the surface through Parkmerced and go on a bridge over Junipero Serra Blvd. to reach Randolph Street. This is a a nice plan, but even at a projected cost of $3 billion, is it really thinking Burnham Big? It would solve traffic problems on 19th Ave., but traffic at Saint Francis Circle and on West Portal Avenue would still remain a problem, as could conflicts between K, L, and M streetcars. A new set of tracks would head west from just south of MacArthur station. Trains heading south from MacArthur could turn on this track to head to San Francisco via the North Transbay Tube. I imagine this would be an elevated track in the I-580 corridor, but it might be over MacArthur Blvd. if there is room to turn the trains there. The trackway follows I-580 over the I-580/I-80 interchange where it descends to the surface on its way to the subway portal. The North Transbay Tube would be a two-track tube laid in a trench dug on the floor of the bay, similar to the existing Transbay Tube. It would begin from a portal near the north side of the Bay Bridge toll plaza, and travel on the bay floor until it reached Treasure Island. It would continue in a subway under Treasure Island, where a new station would be built. The tracks would then continue west through another similar tube until it reached San Francisco. The North Transbay Tube would connect to the upper level of the Market Street Subway. The existing portal used by N and T Muni Metro trains would be closed. The upper level of the subway would be converted to use by BART trains rather than Muni Metro streetcars. This would involve altering the platforms, moving the rails and adding a third rail, and removing the overhead wire used to power Muni Metro trains. Walls and stairways would be altered to allow free transfers between the upper and lower levels. Probably, it would be too difficult to build interchanges between the tracks, either east of Embarcadero, west of Civic Center, or at a point in between. From Civic Center to west of Forest Hill, the subway would be converted to BART use. The portal at Duboce would be closed. I don't have information on the length of the Muni Metro platforms west of Civic Center, so I assume they would need to be lengthened to allow for long BART trains. I don't know if the Twin Peaks Tunnel is large enough to allow for BART use, but if not, it would need to be enlarged, or a one-track parallel tunnel dug beside it. A new deep bored tunnel would travel between the Twin Peaks Tunnel and an interchange with BART tracks south of Daly City station. One way to do this would be to have BART trains exit West Portal Station and head underground just south of Ulloa Street. This would however entail a great deal of disruption along West Portal Avenue and require the closure of Ulloa Street there. Probably a better alternative would be to begin the bored tunnel northeast of West Portal Station. It would intersect the Twin Peaks Tunnel at the circle near Claremont Blvd., and follow Claremont Blvd. and Portola Drive south to Saint Francis Circle. A new station to be called West Portal would be constructed where the subway crosses Ulloa Street, with a new subway entrance where the 76 gas station now stands. The current West Portal Station and the portion of the tracks up to the circle would be used as a Muni streetcar storage facility. A new station would be constructed at Saint Francis Circle. The subway would follow the M-Ocean View right of way to 19th Ave., where it would continue underneath 19th Ave. to Parkmerced. A station would be constructed at Stonestown and another at Holloway St., which would serve both Parkmerced and San Francisco State. It would then continue via 19th Ave. and Junipero Serra Blvd. to an interchange with the existing BART tracks near (presumably just south of) the Daly City station. The idea here is that because there are more tracks, service can be split up between them. Ideally all the lines would operate at the same frequency, except the Daly City-Fremont (green) and Daly City-Dublin/Pleasanton lines (blue), which would operate at half the frequency but be scheduled together along the main areas they have in common. Ideally everything would run every six minutes in the peak commmute hours, which would yield a train every three minutes across most of the map. My view is that automation could make it possible to keep high frequencies even in less busy hours. Subway automation is common throughout the world today. I put Caltrain on the map as a pair of lines: limited-stop service at (generally) existing Baby Bullet stations, and regular service at (almost) all the other ones north of Tamien. The idea is that Caltrain should be upgraded to rapid transit from Tamien northward. I removed a few infrequently used stations. I don't really know what the service pattern or frequency should be, other than it should be a lot more than what it is now. 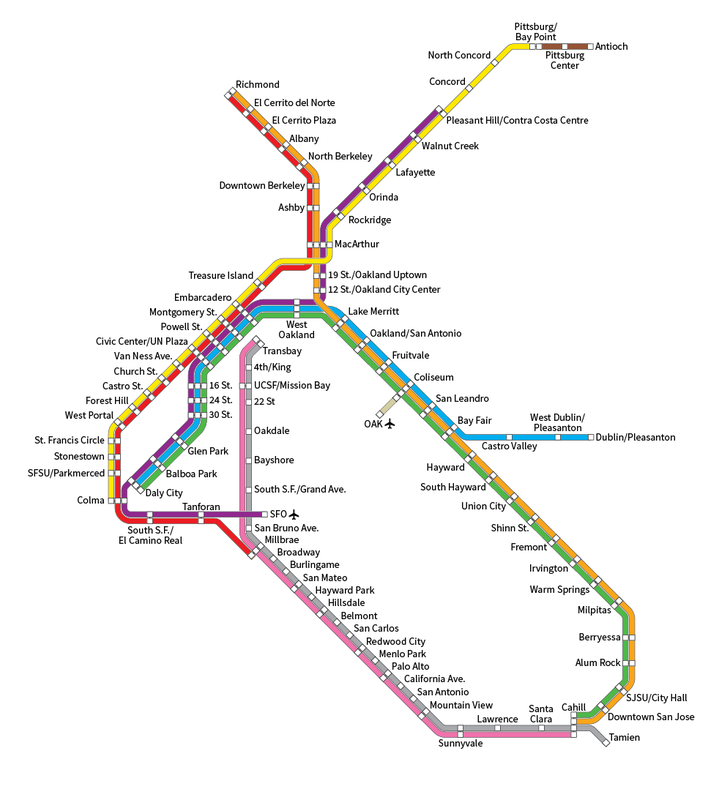 Other than the changes associated with the North Transbay Tube and Muni Metro conversion, I didn't add any new extensions of my own, but I put in the San Jose BART, Transbay Caltrain, and eBART extensions. For San Jose, I eliminated the Santa Clara station which seems redundant, but added a new SJSU/City Hall station in San Jose, since I think downtown San Jose is large enough to justify two stations. All the name changes are intentional, except that I left "Mission" out of the 16th, 24th, and 30th stations only because putting them in screwed up the spacing, forcing Caltrain even further east. Most of them are just because I didn't want to use the same name for a BART and Caltrain station. For one or two, it's just because I didn't like the current names. The J would use historic streetcars or other streetcars modified with poles, to run on the surface of Market Street. It would operate beginning at West Portal Station and follow what is now the M line to Balboa Park Station, and then follow the current J route to Market Street. From there, it would travel up Market Street and then serve the area of Embarcadero between 4th & King and Market Street. The T line would operate in the Central Subway, as is currently planned. Aside from determining what changes should be made, I had fun drawing the map, as I hadn't done a diagram like this from scratch before. The Transit Maps blog had a number of very helpful tips, without which this would have been much more difficult. The font is Source Sans, a free (in every sense) high-quality font from Adobe.